Our special thanks to you all for their cooperation and the wonderful coaching to our young chess masters. We are confident that this will encourage their academic growth through the game of chess. 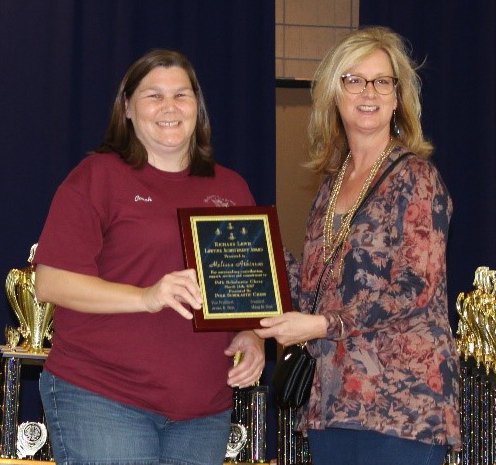 (Inset photo: Ms. Melissa Atkinson receiving the Richard Lewis Lifetime Achievement award from Ms. Trish Pfiffer, Mayor, City of Bartow). For the upcoming tournaments, please ask the players to be present at the usual check-in time at our tournament hall (Bartow Civic Center). We will plan to start the announcements by 8:15 am so that we can start the games faster. Like previous years, unless we have emergencies like the hurricane, we will have four (4) games as usual. We have tentatively planned to complete the tournament day by tentatively 3:30 pm, but will keep you updated via our twitter feed. If you have already registered in the past years on our website, you can login by clicking here. Note that you can reset your password if you have forgotten the same! 1. Login to the coaches Corner. 2. Review and confirm your PROFILE information. 3. Click on "Manage School / Registration Form"
4. Print and execute the new form. Scan it. 8. Result slips for Guppy and Primary divisions. NEW COACHES: Please register online at the coaches corner as soon as you can so that our registration form can be updated accordingly and accurately. We would like to avoid situations where incorrect coach names are associated with the school names.